It’s good to remember what we’re thankful for, but sometimes it gets away from me, I have to admit. Last night I did try making a short list, though, of things I’m thankful for. It started off slow, but grew and grew. I recommend trying it. This week is the 5-year anniversary of this blog. One thing I’m thankful for is all of you readers out there. Wishing you a wonderful Thanksgiving. Congratulations on your five year anniversary of this blog. Here’s to another five years and more! It is a most enjoyable site and informative. Hope you and everyone on here has a wonderful and safe Thanksgiving. Thank you for taking the time to appreciate the meaning of the day, Erik. Have a blessed Thanksgiving! We’re thankful for you, too. Have a great Thanksgiving!! Yes, Erik, I am thankful for you too. If it wasn’t for you I would feel alone out here being an Amish fan. You have gathered us together and that has encouraged me. I thank God for you! Count your blessings. That will take you a long time in this country, being a part of the 99 percenters or not! Happy Thanksgiving to you and to our family for getting ready to welcome our son home from Iraq in three weeks. Thanks for all of your hard work. Please keep it coming. Happy Thanksgiving to each of you as you enjoy moments spent together with family and friends, or if you are celebrating alone, remember the good things from the past year and be grateful. Erik, I am grateful for this blog and the hard work you put into it ~ those of us who share genuine interest about the Amish, what they believe and their way of life, have a place to gather and know what we read is authentic. I raise this prayer for you today. Wishes for a wonderful and blessed Thanksgiving to all! thank you god for our thanks giving! if it was not for you, Turkeys would not be here! A blessed Thanksgiving to you and your family, Erik. Thank you Erik, and Happy Thanksgiving to you and the wonderful work you have done on this site….Love Amish Living and have met some nice people on here….love sharing recipes, etc on A.L. Also, to Lois Morgan, God bless your son for his work in the Service and praying for his safe return to the states in 3 wks….I do hope they all get to come home…..it has been way too long…. My son is in Afghanistan not in the service, but on a special mission and still has about 14 mos. left there, I pray every day for his safety and will look forward to his return also….I got an email from him today and they were treated to a nice Thanksgiving Dinner with Turkey, Ham, Prime Rib and all the trimmings…..so today they will eat well….. I thank the Lord every day for all the blessings He has allowed me, for my family and their health, and for all those who need prayers. My prayers and Scripture readings have become daily since knowing the Amish in Unity, ME. They have taught me good habits. Thank you, Erik, for this web site. Best wishes to my American neighbors and congratulations on the fifth anniversary of Amish America. On Friday it will be one month till Christmas, I suppose that’s one reason why its black in the US market, up here in Ontario that has become a minor marketing scheme for some chains, particularly USA based ones. On another note, Amish related, my local newspaper reported that some of the Amish Beard Cutters had been arrested. I was surprised for several reasons, for one thing the article was sourced out of Los Angeles and, secondly, it included a picture of the leader of the Mullet group. Maybe it was old news, but my local journal published the story on November 24, 2011. Oh, I saw on the BBC website under the main headlines the Amish beardcutting folk who got arrested…so it’s actually international news! I’m thankful for you and the articles and pictures you post. I’m so glad I found this site! What a lot of nice comments. I promise I wasn’t fishing for them, but your compliments and warm wishes are truly appreciated. Hi Erik do you know of any settlements over near Gatlinberg Tn. We are going on vacation in February and would love to visit a Amish settlement. Hi Dan, outside of Ethridge the other Tennessee settlements are really very small, 1 or 2 churches. And unless there’s a very new Tennessee settlement I’m not aware of, none of them are near the Gatlinburg area. In fact from Gatlinburg you might just be closer to Amish in KY or NC than you are to Tennessee Amish. Happy Thanksgiving to you also! We spent the day with family. I like your comments about the Amish and feel you have been very fair in observing different areas. Thank-you for the opportunities you present to us. Happy “Belated” Thanksgiving to everyone and especially Erik. Five Years is a long time for this kind of dedication! Thank you for sharing this small piece of American culture with us, and letting us see that there is some sense of “togetherness, forgiveness, and family”, in this topsy-turvy world of ours! We spent the day with part of our family, and had a very good meal, and thanked God for our many blessings—with a special thanks to all military families having to endure the absence of their loved ones, serving overseas and keeping the peace in the U.S. as well. Happy ( belated ) Thanksgiving Everyone! And happy 5th anniversary, Erik, and thanks for all you do to provide this great site! Lucky me went up to Lancaster County on Tuesday, mainly for Root’s Farmers Market in Manheim to get all of the fresh produce and goodies I needed for our Thanksgiving feast. We had it at our house with me cooking the turkey and making the stuffing and Amish pumpkin yummy cake, and the rest of the family ( 13 in all ) brought the rest of the side dishes, drinks, and more desserts. So I am very grateful and thankful to still have most of my family around to share special times like this with – even though it is alot of hard work! 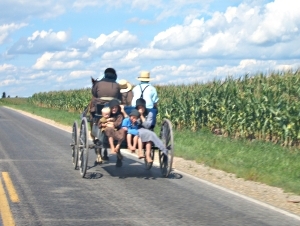 And God bless the Amish who have to do it all the time for their big families, church services, weddings, and benefits, and all under such old fashioned conditions to boot! Wish to add to the comments, happy, Erik I love what you said about counting your blessings. On my birthday last year, I decided to try to come up with 52 blessings for each year, and as you said, once I got started it grew easlily & before I knew it, I had a list of 52! If we focus on what God HAS provided it is amazing on what we will realize how blessed we are, even for the trials He brings us through to conform us more in His image by them. I’ve enjoyed your site Erik-I like to think it is fair & balanced like Fox Cable News as opposed to CNN-because we can glean from the Amish but must realize they are simply simple yet complicated to understand people who while gaining admiration from the world, also may need prayers as well, like all people seeking the Lord’s grace, mercy, & peace for salvation by Jesus blood that cleanses us. May the Lord bless you and His will for your future with this site be done. I was thinking of visiting Ethridge the Saturday after Thanksgiving; Nov. 24, just wondering if I will find everything closed or they will open that Sat. Thanks in advance and congrats for the awesome blog! Short of time but not short of prayers for all who can and do take a moment to give thanks to God and each other, today. Having always been interested in the Amish beliefs and way of life, I find this blog a treasure of information and I thank you Erik and all other contributors for this wonderful opportunity. The photos are beautiful,too. Happy Thanksgiving to all of the people on this website & especially to all the Amish Families in America! 1. I am thankful to be alive & well. 2. I am thankful for my family. 3. I am thankful for the type of work I am doing. 4. I am thankful for food on my table & a roof over my head. 5. I am thankful most of all for God for what he has done to help me and other people out. 6. I am thankful on this day: to wish all the AMISH FAMILIES a Happy Thanksgiving & I hope they receive many blessings for all the hard work that they do. May God continue to bless them everyday with good health for their families & friends the rest of their life. I’m not Amish! But they are beautiful people in their ways! 7. And May God Bless America on this day!